Because of my own Kundalini awakening, I thought that all Kundalini awakenings are sudden and spontaneous like mine. Recently, I met a rock climbing friend who told me about her Kundalini awakening. She first began spiritual work and exploring spirituality. As she progressed, she felt changes to her body such as her ability to feel her own energy, and her awareness about things that are happening to her. She did not even realize that she raised her Kundalini until she recently talked with me. Awakening can occurred gradually like my friend or suddenly like with me. For those of us with trauma, abuse, and other emotional injuries, our Kundalini rising maybe be more difficult. Some may experience psychosis like or physically painful symptoms. This causes much anxiety and fear within us. The key to a smooth transition for our Kundalini awakening is to deal with our anxieties and fears. Grounding techniques are important to learn, such as deep breathing, yoga, Chi Gong, walking in nature, sitting or lying on the earth, exercise, listening to calming music, acupuncture, massage, Reiki, and any forms of energy work. Doing some spiritual or emotional work prior to raising our Kundalini is highly recommended. Hi, you got very interesting and inspiring post. I have a question, well, not one but many! How do you know if the kundalini is awaken? Do you still behave like normal human? And this kundalini does it also means an awakening of the subconscious mind? Starseed Dave saying HELLO !! Thank you for your reply. I absolutely ‘get’ the meridians, but its weird that its only one hand. Its gone now..!! but knuckles are still a little stiff. This is sometimes a difficult journey! I very much like your post here. One thing though, about the “breathing” which you mention. I think there is a profound and potent link between the breath and kundalini, so anything other than close to normal breathing may not be good in many cases since breathing fans the flames just as, in the mundane world, oxygen feeds a flame. I’ve been in counseling about seven years and It’s been very helpful. A lot of times I just sit there and don’t say anything just sort of let my mind wander around and peruse my body and just see what’s going on so I can find a starting point (that usually begins what I talk about that day). Even more recently, I have been doing this thing where I nearly fall asleep and sort of keep myself on the edge of falling a sleep and almost dreaming. I usually feel between awake and asleep. I find it relaxing and usually do it as a response to stress. I was doing this yesterday and then I felt this growing steady rhythm in my thighs that felt like it was shaking me and a pretty quick rate (like a very fast heart beat). This went on for several seconds and then I got nervous and thought my heart was beating real fast and checked my heart beat at my wrist and it wasn’t going as fast as these rhythms that were coming from my thighs and then pushing up into my torso (at least thats what it felt like). Checking my heart beat took me out of the experience and then it dissipated. I did notice that I felt very different…much more upbeat and positive..where I had entered feeling frustrated and down and irritated with myself and not wanting to engage. This resonance experience I had was like the dividing line between these feelings of irritation and then feeling peaceful and much more ready to engage. I was confused by this experience and asked my therapist. He said it sounded possibly like a Kundalini experience. Thoughts?..just started reading about this today (and now I found your site) and I don’t know. Much kundalini seems to originate in the spine from what i read and mine shaking felt like it started in my thighs and then went into my upper body. What do you think? DOes this sound like a Kundalini experience? The “thighs” you mention correspond to the “basic center” or “root chakara” which is widely regarded as the “home” or source of kundalini energy. I think there are many different levels of awakening and there are certainly a wide variety of experiences reported in connection with kundalini. The energy moves from below upward toward other centers in the body (seven main ones) in most spiritual traditions and many minor ones exists as well. 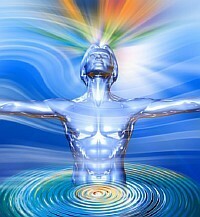 The shifting energy stimulates the consciousness associated with the centers it energizes. Where it moves and its affects, and the degree of them, depend on where the individual’s consciousness is habitually focused. Kundalini can stimulate or awaken along both positive and negative lines and often a combination of these. It can be associated with psychic experiences, healthy changes, bodily sensations, pains for some, and with shifts in consciousness of all sorts. The energy is like sunlight in a garden from which weeds as well as flowers can grow, so when confronted with increase of energy, it is well to be a good gardener–which is to say a good person with healthy uplifting thoughts, and thoughts not excessively focused on egotistic concerns. Kundalinispirit mentioned that one may feel a warm sensation and that is often reported, but there can also be a cool sensation. There is, I think, a feminine and masculine polarity to the energy (the “Ida” and “pingala” of Indian tradition) ; ida carries cold energy, pingala carries hot energy. People different in the proportions of these two. I think these two do not especially correlate to being in a male or female body but are rather related to ones psycho-physiological-spiritual type. Hi, I feel an energy attached to me for a very long time and it controls and guides me in everything that happens to me in life. I want to come face to face with the energy and want to understand why this happens with me. Any thoughts how to achieve this? Thanks Brooke! Is this common? Have you heard of anybody else with similar experience. Is this related to Kundalini rising? Thank you for your kind reblog and sharing my thoughts with your readers. Love & light!